World of Tanks will be a free download title for the new, slim 360 console. 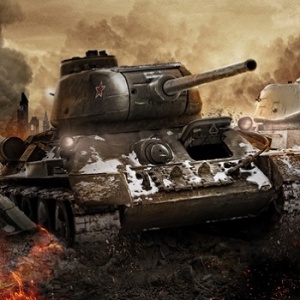 Xbox One may be Microsoft's new toy, but it's not giving up on its old one, and one of the titles available for the new, slim 360 will be the massive freemium armored behemoth title World of Tanks. It's one of the many new titles promised by Microsoft, and it will be free to download this summer. "We have delivered a global hit on the PC," boasts Wargaming.net's CEO Victor Kislyi, and now the Xbox Live 48 million member user base is its next target. "When we thought about which console platform delivers the best World of Tanks experience," says Kislyi, "[the xbx 360] was the perfect match." The epic tank battle simulator depends, on PC, for microtransaction revenue, and presumably the same will apply to the 360 edition. Kislyi wasn't kidding about its PC success; this is that same title that claimed the most players ever on a single server, earlier this year. Like tanks? Have an Xbox 360? Then this should be a good summer for you! Oh hey, that'll be fun to play. They recently got rid of the Pay to Win elements right? That explains why WoT got rid of the Pay-to-Win elements recently. With the upcoming World of Planes, that'll likely be another Xbox game. I wonder if MS is going to be allowing these games onto the Xbone, or are they too 'indie' for the Xbone? It's be a rather sub-par answer (but an answer nonetheless) for the quality Planetside 2, DCUO, and Warframe. It says for the new slim 360. I assume it'll work on regular 360s too? I hope so. If they pull that stunt...well, my opinion for Microsoft could always stand to get a little worse. Hey, something not on the Xbone. This I'll actually play. Wonder if it will be cross-platform play, that would be...interesting. It won't be free. You'll need a $60-a-year gold account, since silver accounts can't play multiplayer. As if the Matching Making,team-mates, arty, platoons and gold ammo wasn't enough...Take notes kids; listen to the fuhrer well because this is only going be said once.